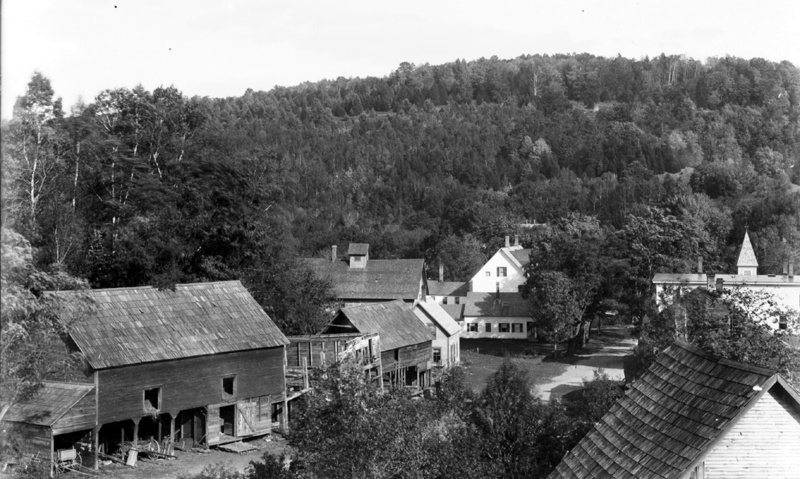 Tyson Church Steeple peeks over Hubbard Hall, c. 1890. Oh, my – what changeable weather these days. As I write this on Sunday, it has been a lovely day. Karen Evans, June Capron & I went snowshoeing & it was delightful. But we know that another winter storm is bearing down upon us & will likely have left a foot or more of snow by the time you are reading this column. Although no Emergency Service personnel were called out, there was apparently an accident on Rte 100 near Hawk on Saturday involving 2 vehicles. The person who reported it to me said that all of the occupants were out of the cars & surveying the damage, so I don’t think there were serious injuries. Just another reminder to be careful…. Instead of ruminating about winter, it is time to enjoy it. There is plenty of activity (indoor & outdoor games, tubing, crafts & great food) at Bethany Birches Snow Camps. Lynx Camp is February 14-17 for grades 5 – 7. Polar Bear Camp will be February 20-22 for grades 7 – 9. Bobcat Camp takes place February 27-3/1 for grades 3 – 6. Go to http://www.bethanybirches.org/winter-camps for more information. There will be an Open House at the Historic Site on 2/14 starting at 10:00 AM. Youngsters can enjoy activities downstairs at the Education Center. Rushad Thomas will be giving a talk about Coolidge & Cuba at 2:00 PM in the Great Room. Fun for everyone! Some of you may know that long-time resident Angela Miccio has sold her home in Plymouth. I first met Angela after she started her B & B across from the school & when she volunteered with the fledgling Plymouth Press. At that time we actually used to paste it together by hand! I want to welcome Michelle Coates-Girard, husband Donnie, 8th grader Hannah & 7th grader Owen who recently moved from Rutland into Angela’s former house. We look forward to getting to know them! 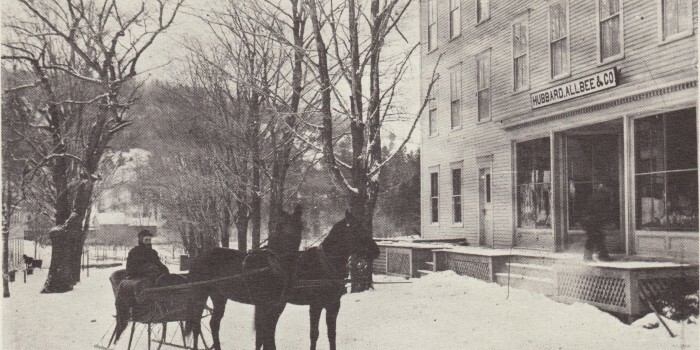 Hubbard Hall stood in the now-empty lot just uphill from Tyson Church, c. 1890. By the way, 33 people attended the Reach Out Luncheon on 1/22 to hear Laurence Jeffery from the Echo Lake Inn talk about the history of the Inn & the surrounding neighborhood. He also brought interesting pictures & a poster about the dances that were held in Hubbards Hall, which stood in the now empty lot next to the church.. It seems that Tyson was a lively spot years ago! Also, Laurence very kindly donated the Tyson stove from the Inn to the Plymouth Historical Society. We miss having Bill Jarvi in the neighborhood & in church, but daughter Lauren brought him to the luncheon & folks gathered around to greet him. In an attempt to truly make the Bible God’s living Word, we explored studying it through Lectio Divina in church on Sunday. We will continue our discussion of the book Sensible Shoes in the coming months. This entry was posted in Community News and tagged Bethany Birches Camp, Calvin Coolidge State Historic Site, Margo Marrone. Bookmark the permalink. 12:00 Noon to 4:00 p.m.: Museum, Activities, Coolidge Quest, Cheese Factory Open. 2:00 Lecture: Why was Calvin Coolidge the only sitting president to visit Cuba? Rushad Thomas, Program Associate, will speak on Coolidge’s 1928 trip to Cuba and the complicated relationship between Cuba and the United States. Hands on activities in the classroom (noon-2 and 3-4) include diary making, writing with ink pens, voting rights timeline, exhibit on Edison’s, Ford’s and Firestone visit to Plymouth and lots more.